Just clicked the news to see Kelloggs Ricicles are selling for £8+ a box on eBay after Kelloggs announce they are to be withdrawn from sale due to their campaign to cut down sugar levels! Some eBayers selling 10 boxes for £80+! Crazy. Good old Amazon Pantry. £2.70 each and one cost of £2.99 for one pantry box and 99p thereafter for more pantry boxes if required. £13.41 for 5 x boxes from Amazon but appears to be like a back order. Can't believe anyone is sad about this. Just put your own sugar on Ricekrispies. Thanks a lot fat kids. Can't believe anyone is sad about this. Just put your own sugar on …Can't believe anyone is sad about this. Just put your own sugar on Ricekrispies. Rice Krispies are apparently getting a 20% reduction in sugar so make sure to add 20% extra. Out of all the super sugary cereals to choose from, who even picks these anyway? Just put sugar on Rice Krispies. 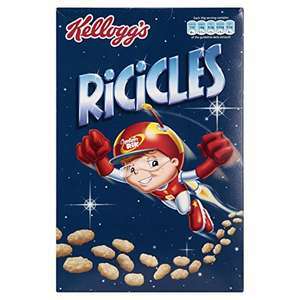 Oh man, I love Ricicles but they are so hard to find!! I'm guessing Kelloggs has been phasing them out in recent years anyway. Im confussed, heat added as its you.....but £6 for a box of cereal? Let them be gone. Im confussed, heat added as its you.....but £6 for a box of cereal? Let …Im confussed, heat added as its you.....but £6 for a box of cereal? Let them be gone. Ricekrispies are apparently getting a 20% reduction in sugar so make sure …Ricekrispies are apparently getting a 20% reduction in sugar so make sure to add 20% extra. Hooray! I only eat the Aldi ones, because they have less sugar to begin with. The extra calories is marginal. Most of the calories comes from the fact theyre grains which will always be high in calories.. It all down to people trying to earn brownie points and look like their doing something whilst ruining things for everyone else. If its the sugar in the cereals at fault how come the generation brought up on these cereals were nowhere near as fat as todays youngsters? Original sugar puffs gone, original honey nut loops gone, yet the new versions have almost the same amount of calories as before. The obesity problem is not due to breakfast. Ricicles, Ricicles, rhymes with bicycles....and tricycles. Rip. Ricicles calories per 100g - 383Rice Krispies - 372Kelloggs Special K - …Ricicles calories per 100g - 383Rice Krispies - 372Kelloggs Special K - 378Frosties - 369Kelloggs Corn Flakes - 357Weetabix 362Shredded Wheat - 344The extra calories is marginal. Most of the calories comes from the fact theyre grains which will always be high in calories..It all down to people trying to earn brownie points and look like their doing something whilst ruining things for everyone else.If its the sugar in the cereals at fault how come the generation brought up on these cereals were nowhere near as fat as todays youngsters?Original sugar puffs gone, original honey nut loops gone, yet the new versions have almost the same amount of calories as before.The obesity problem is not due to breakfast. My stance is that I will never buy their products again and move onto another brand. I grew up as a kid eating most of the bad stuff and I'm not fat and still have all my teeth with zero health problems so it hasnt done me any harm. It's a joke this country. Soon everything will be ruined , we already have reduced chocolate bars, …Soon everything will be ruined , we already have reduced chocolate bars, packets of crisps, soft drinks and now cereal ffs, where will it end....My stance is that I will never buy their products again and move onto another brand.I grew up as a kid eating most of the bad stuff and I'm not fat and still have all my teeth with zero health problems so it hasnt done me any harm.It's a joke this country. It seems sugar acts differently for different people. Its cos there is sugar in everything. Better to be safe then sorry. Need some kind of regulation. Sugar also is addictive and makes you hyper. You do realise that's half the problem with this site? Deals should be voted on based on value, not on who's posting it. You do realise that's half the problem with this site? Deals should be …You do realise that's half the problem with this site? Deals should be voted on based on value, not on who's posting it. Not really a big deal is it pal? It's currently -116. I knew it was going to go cold so it hasn't really ruined anybodys life? Not really a big deal is it pal? It's currently -116. I knew it was going …Not really a big deal is it pal? It's currently -116. I knew it was going to go cold so it hasn't really ruined anybodys life? He has a point though-a lot of the time it is clear that a hot deal is down to the op. 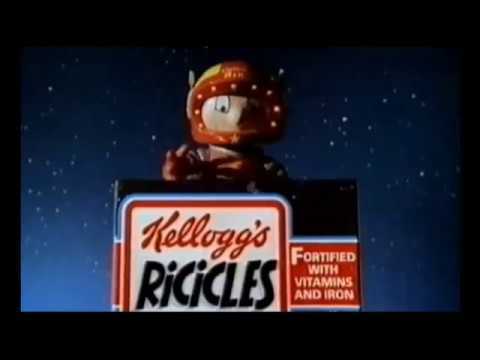 Years ago, ricicles used to sell ok. I worked in a supermarket in the late 80s and early 90s, and remember that they tried to rebrand them, adding marshmallows, etc. Sales dropped to virtually none. They brought the originals back, but sales never really picked up. No surprise they're dropping ricicles and not Frosties. NNNNoooooooooooooooooooooooooooooooooooooooooooooooo I used to live on these as a child, I am not fat. Government micro management grrrrr... Its all Jamie Olivers fault. Doors slams.... burns down to the supermarket!!! Not that I have any interest in ricicles anyway but wow this is dumb! :0 just like how Harvey Kellogg originally developed corn flakes in an attempt to stop people masterbating! True story.. SO not the same !! - just like COrnflakes woth sugar are not the same as Frosties !! Dropped due to sugar content or dropped cos no one buys them and taking the opportunity to just bin them while using it for PR? I dont buy their products but Kelloggs can gtfo anyway. SO not the same !! - just like COrnflakes woth sugar are not the same as …SO not the same !! - just like COrnflakes woth sugar are not the same as Frosties !! It's a pretty close approximation. Frosties the flakes are a bit thicker because of the sugar. You could probably get some sort of sugar solution to stick. Scientific evidence is total BS tho. Its only evidence until science disproves it and supports something else. There has to be an enemy of the people at all times, now its sugar, at other times its been alcohol and next up it will be disposible packaging. The end result is always that they add a tax to whatever is the target, isn't that a coincidence. Years ago, ricicles used to sell ok. I worked in a supermarket in the late …Years ago, ricicles used to sell ok. I worked in a supermarket in the late 80s and early 90s, and remember that they tried to rebrand them, adding marshmallows, etc. Sales dropped to virtually none. They brought the originals back, but sales never really picked up. No surprise they're dropping ricicles and not Frosties. I work in Asda and your right nobody hardly buys these, its Coco Pops and Frosties that sell. Even the new style Sugar Puffs don't sell well now. Who'd ever buy these on eBay are nuts. He has a point though-a lot of the time it is clear that a hot deal is …He has a point though-a lot of the time it is clear that a hot deal is down to the op. Yes, this is my point exactly. Don't get me wrong, many of the deals by top posters are good and you can see the effort that has gone in to finding them, but sometimes the same / similar deals can be posted by other members not in 'the inner circle' and they either go cold or are luke warm. Certain members deals...you see the comments come in in the same order by the same people, even if it's mediocre and before you know it, it's the days top deal when in actual fact, it's a bit pants. It distorts the site all in the name of 'you search my back, I'll scratch yours'. Honestly, they could post a deal for a mouldy turd for £50 and it'd go hot. Back to my opening remark, though - I do see the effort that goes into finding these deals which you can't argue is top notch...but there isn't parity across all members deals which is highlighted in the original comment I posted. I got the last box in my local last night... not had them since I was a kid so got one last box before they go! Just had some and they aren’t as good as I remember!